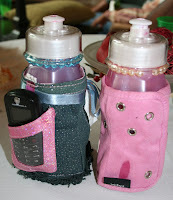 ...it all started with the personal sippy cups. 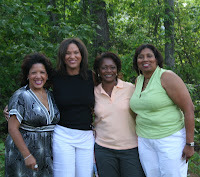 I arrive in Atlanta for my girlfriend Karen's house warming weekend soiree. I catch a ride from the airport with Errika, walk in the house, and -although Karen was not at home at the time - she had left instructions that I should be directed to the fridge where my "purple coolaid" was waiting for me. Let the drinking begin. Karen had almost her entire family at the her home...She has 10 brothers and sisters...and I never laughed sooooo much in my entire life. Her family is large and loud and just down right hilarious. We spent Friday evening drinking till we reached steady state. It was not difficult with the wonderful assortment of beverages Karen had in her beautiful cherry wood bar. I played bartender for a few hours and we danced to old school music mixed by "Crunch" - one of Karen's many nephews or cousins - I just couldn't keep it straight and I still left without knowing Crunch's real name. All I know is (or is that remember) about 2:00 am, I was inflating air mattresses trying to just fall face down on one and Karen was trying to tuck Belinda and I ONTO the air mattress with hospital corners. Make her go away. I think I woke up in the same position as I fell out - 'cept the mattress had deflated a tad. Oh Well. So we hang out on Saturday morning and I make a liquor store run - I've been assigned the task of making the "special juice" for select ladies. The rest of the riff raff will have to drink the specialty drink provided by the bartender that would not arrive until 5 pm. We just can't wait that long. I also was assigned the job of family photographer and was on duty for family portraits at 5pm. WHEW! It was like herding cats and one of Karen's brothers did not want to cooperate cause I was "stealin' his soul." He figured he'd get it back when I emailed the pics (yes, he gave me his email address). I managed to get myself beautified, make the special juice, take family portraits (throughout the weekend I took over 250 pictures) and start the move towards steady state. I made it till about 1am and then crashed and burned. It was a great party. ...and then it suddenly went all wrong....(just kidding)...but Karen decided we were all going to get ready and go for a family bike ride on the local trail. It took almost 2 hours to get everyone up, dressed, issue a bit of hair of the dog, sort out the travel arrangements and get to the park to rent the bikes. Lord have mercy. It was a blast! We rode a total of about 8 miles, laughing, racing, cracking jokes and just enjoying the day. After we got back, I made "Special Boy Sandwiches" taught to me by my bestest friend Pattey...yeah girl...I showed em how its DONE! We dozed on and off, played cards and THEN...it was DANCE REVOLUTION TIME. Karen taught me how to play - funny - she has a XBOX 360 and only one game. Go figure. Now I'm freakin addicted and will probably go get me the game - but I gotta check out the WII - WEE wanna play. A weekend with a large family would not be complete without the requisite family drama on Monday. There was an issue with the teenagers spending the whole weekend sequestered in a guest room with a computer - they were on their MySpace. A little tinkering with the history on the computer and we had a print out of what they were writing. I nearly went blind from reading it. FAMILY MEETING! Nothing really go solved - does it ever. Nevertheless, I was honored that Karen's family included me in the discussion. Not that I had much in the way of solutions, but the discussion was just so real. I'm back home...THE PARTY IS FINALLY OVER...and its back to work. Do you just go out and find all these fun parties and people or do you bring the fun with you? Glad you had a good time. It sounds like a blast.